No matter how tough things get, always remember, never give up. It’s always worth it in the end. Pieter Herbst is an enthusiastic angler who is committed to turn his passion into a full-time career. 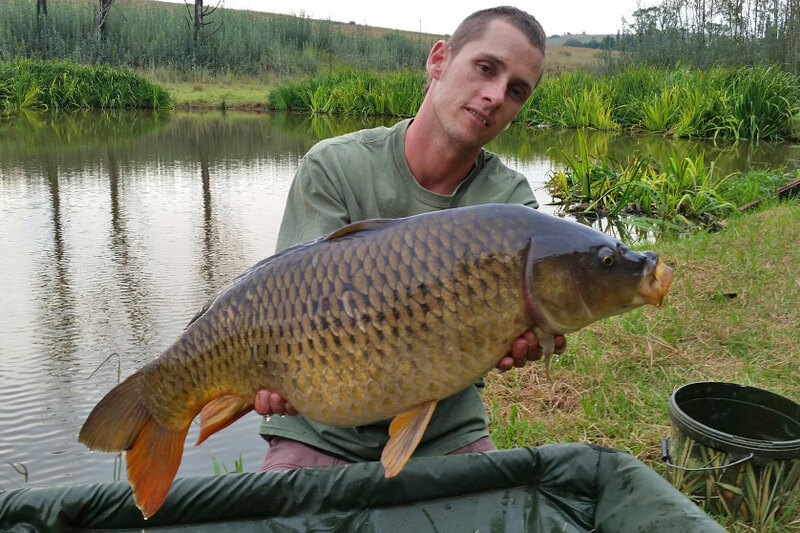 His big dreams and ambitions for this sport have made him a familiar name amongst the South African carp angling community. 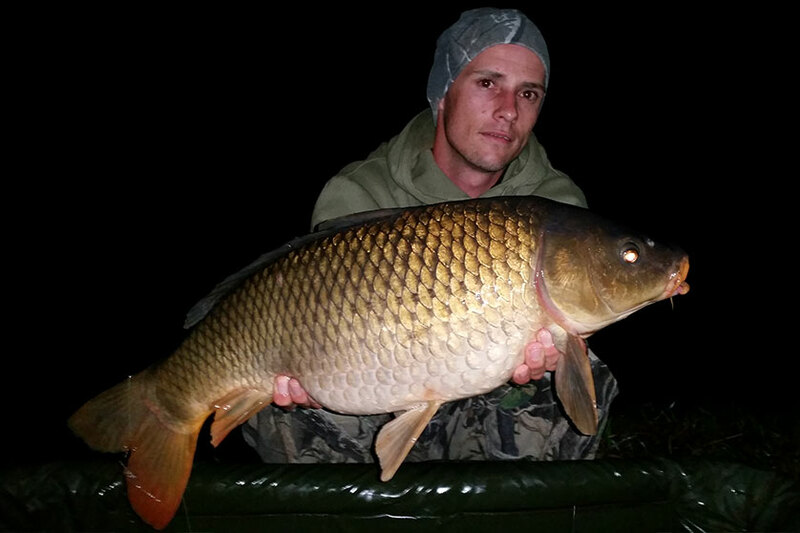 He also writes about his experiences which are published in the local specimen magazine, The Carp Angler, where he contributes as the ‘young gun’ to their team. Thank you for taking the time to complete all our questions in such detail Pieter – it is great to have such passionate people in South Africa. All the best with your big dreams. I’m an apprentice, studying Rotary Offset Machine Minding through CTP Printers Johannesburg. 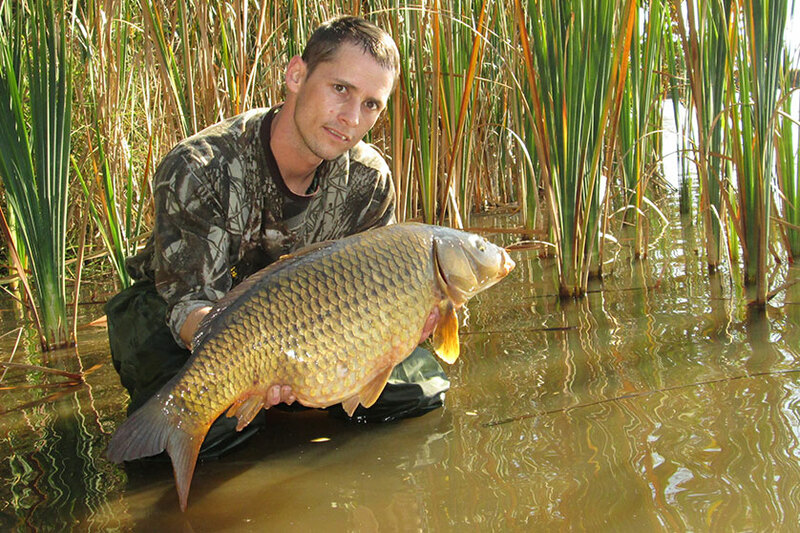 Where did your interest in angling start and at what stage in your life did you decide to hunt for big carp? I started off as a conventional angler, while doing this I had the chance to be a martial at the first Tzaneen Carp Classic. I was astonished by the sizes of fish the competitors landed and my fever for big carp got the better of me after this eventful week. 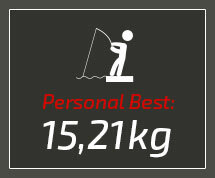 What has been your biggest achievement in angling the past year? This is not physically fishing related, but one of my lifelong dreams is to be a full-time angler, or have it as a career. Although I haven’t reached that fully yet, writing for The Carp Angler magazine is a start to that dream. Also to be able to help others with knowledge and tricks is without a doubt my best achievement up to date. Please tell us more about your most memorable catch? This one fried my brain, but it would have to be at the Tzaneen Carp Classic where the specimen bug got hold of me. We stayed another two days after the event to fish and to relax after a tough week. My most memorable catch came from that waters, simply because there are no words to describe landing a fish with a hippo in the vicinity. This was a lovely, fully scaled mirror of 12.50kg which made me switch over from conventional angling to specimen. Do you have a venue that is close to your heart? There are a few places that come to mind, but Florida Lake has to be the one. This lake has taught me so much and has brought me some of the best-looking carp. It also taught me that it’s all about the amount of effort you put in. 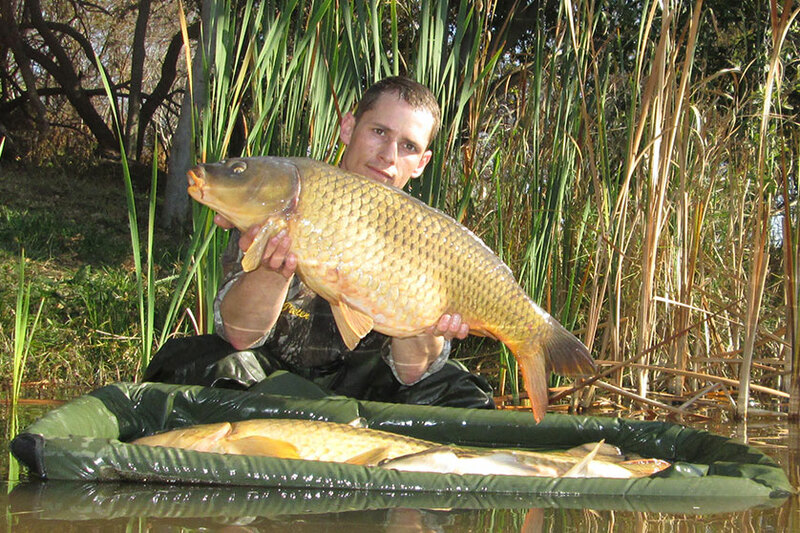 What would you say are your main strengths in carp fishing? I would say my techniques, approaches and routines are very different to other anglers. That’s often what gives me the edge on landing the first fish or sometimes landing the ‘pristine one’ in the toughest conditions. What is your favourite rig, regardless of conditions? Personally I love fishing with a Blowback Rig, regardless of the conditions or weather, this rig has never disappointed me. Lead size and arrangement preference? This all depends on whether I cast or use an inflatable. When casting, I prefer a 3oz casting lead. If I had to attach a stringer or PVA bag, I can still put in my all and get it out far without my rod taking any unnecessary strain or any attachments going astray. When using an inflatable, I like to go heavier – a 5oz and preferably using a gripper lead. It lays nicely on the bottom. I like to find ledges when fishing and the gripper sits firm on the bottom or slope and ensures a proper hook set on a taking. When you arrive at your selected venue, what is the first thing you do? As I get to the swim, I like to walk along the margins before I decide where I’ll setup. While making this choice, I’ll watch the features close by. I will cast a single hookbait right on top of any fish that might show themselves, before any action on the bank spooks the fish to open waters. Favourite fishing tactic or method? My favourite tactic would be fishing the margins. A lot of people think that the water might be too shallow, but you’ll be surprised. Most of my fishing depends on this tactic and it has never let me down. Although in winter, I do change my approach. Together with this, the mouse trapping method would be my most successful method and most frequently used. Do you prefer fishing with braid or mono? I prefer fishing with braid for a reason everyone can agree and that is when fighting a fish, it’s a one on one fight. You can identify anything, even to the extent of a headshake during a fight with your prize. Another reason would be the features I fish could cause some difficulty if had decided to use mono. Preferred weather conditions, and why? I must say (and agree with many anglers out there) that tough waters and rough weather conditions do produce a lot of great catches as I have encountered a few of these sessions. But, I wouldn’t miss a day’s fishing, even if there was no wind and the sun is baking over mirror-like water. Being able to sit outside, enjoying a beautiful view while one of your rods suddenly takes off... it is the ultimate for me. What’s you favourite feature to fish? I love fishing reed beds in shallow waters, finding holes or any nice, hard spots along these beds has brought me some of my most memorable catches. My reason: I can always observe to see exactly what happens on the bottom and keep a close eye on fish routines and patterns. I believe that’s the cutting edge to specimen angling. If you had the option, would you rather land one quality fish or multiple decent fish? Or would any action be enough to cure your ‘fever’? That does sound a little tricky and a majority of anglers are after the big one as we are all chasing and working on our PBs. However, I prefer to land multiple decent fish, as I would rather keep busy and not sleep than sitting days on end, waiting for that one big fish. What would you say is the single most important thing to remember when fishing for big carp? The single most important thing to remember would have to be observation. If you put in effort, to observe and figure out what routines or patterns these big carp have and follow, I can guarantee you a lot of success and a few more runs every session from here on. Which do you enjoy most: short, blitz sessions or are you in it for the long haul? I do shift work, so it’s a little difficult to do short blitz sessions. I like doing things proper, so the long haul is the better option for me. Having more time I believe is the key to the specimen game. Who’s your biggest inspiration in specimen angling, locally and abroad? Abroad would be Frank Warwick – he is a perfect example of someone that puts in a lot of effort and that goes the extra mile with everything. The amount of detail he adds to DVDs and articles are of top quality in my view. I’ve learnt so much from him, and that has definitely brought some great success to my angling. Locally, it would be Ivan Jooste and Jaco Coetzee – these two gentlemen has helped and supported me since the first day I changed over from conventional to the specimen scene. The knowledge they have are ridiculous, and learning all this and being able to fish with them is not only a pleasure but also more like my own private sessions on tips and tricks. Boilies or particles – which play the biggest part in your angling? Boilies, as I fish them most of the year. I personally think that boilies are better for fish and their safety, as particles are a little more difficult to digest. Although, in spring and early summer, I do use particles as fish are more after natural nutrition at this time of year. Homemade boilies or store-bought, and have you ever tried to make your own boilies? I tried to make homemade boilies when I started out and had success, but I have limited free time. When I do have spare time, I’ll rather put in extra time next to the waters, so store-bought is my preference. What is your favourite boilie flavour to fish? A BFA boilie called AK-57. 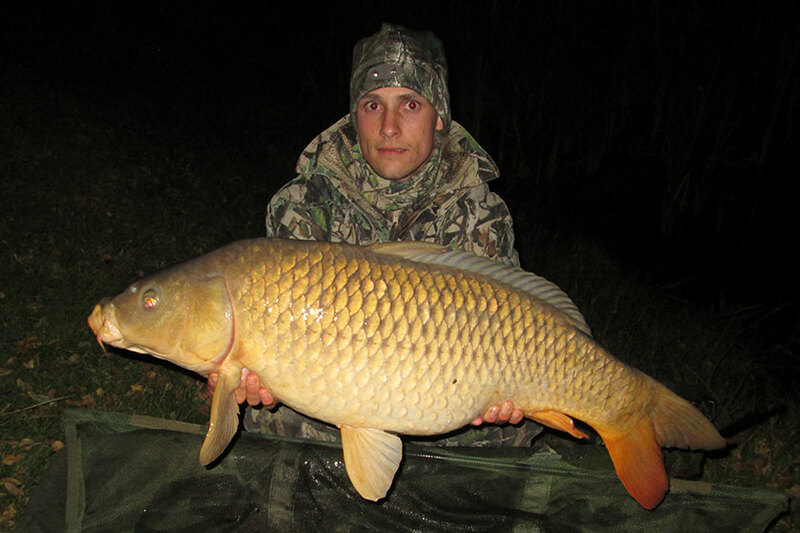 I’ve been fishing this specific boilie for the last six months at over eight venues. At all of these I've had some great sessions with some pristine fish. Would you rather be rich, but never fish again or poor and fish when you want? I don’t even have to think twice here; I will without a doubt rather be poor and able to fish anytime then being rich and not being able to fish at all. Do you enjoy fishing for other species of fish? To be honest, no. However, if I do fish a venue that has bass, I will always get my carp rods in first and while waiting, I’ll try to get into some bass. Do you have any lucky charms or special routines you like to follow? No lucky charms, but concerning routines. One thing I always do before I bait up or touch anything to do with bait is washing my hands in the lake with some mud, ensuring no funny smells come into contact while I bait up or re-bait. What is your preferred bankside grub when you’re out for a long session? My favourite meal would be a nice rump steak potjie and some biltong for snacking. Have you set any goals that you wish to achieve this year or in the future? I have yes. My personal best is not that big, so that would be the goal on my priority list – landing a 50lb mirror would be my ultimate goal. Are there any tips or lessons you’ve learned that you would like to share with our readers? No matter how tough things get, always remember, never give up. It’s always worth it in the end. I still remember how I nearly gave up and am so glad I didn’t because then I wouldn’t have had this opportunity right now. So, a special thanks to CarpFever for this opportunity. We would love to hear from you, so please email your question and advice to info@carpfever.co.za alternatively post your comments below.